My sister sent me an article from Smithsonian Magazine about installing wind turbines on bridges to create electricity. 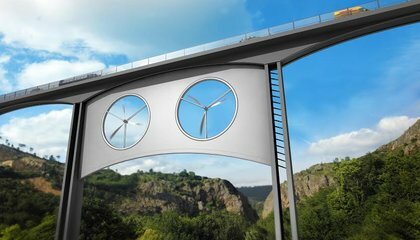 In the drawing above, mechanical engineer Oscar Soto imagines how turbines could be installed on the Juncal Viaduct in the Canary Islands. He said that any place with wind speeds between 6 and 25 meters per second would work. I imagine that bridges spanning mountain canyons like we saw in Mexico would have sufficient clearance for a wind turbine. However, tall bridges have enough trouble resisting high winds without having to resist the additional drag forces from having deep longitudinal diaphragms installed between their piers.